I know I have committed a sacrilege! The rains are already here…the mangoes are almost on their way out and not a single post with mangoes on divinetaste this season! I don’t know how this happened! That I have been travelling and attending to certain uncertainties of life is no excuse! And this doesnt mean that I have not been enjoying mangoes this season. Ro and I enjoyed a few crates of mangoes in Mumbai. 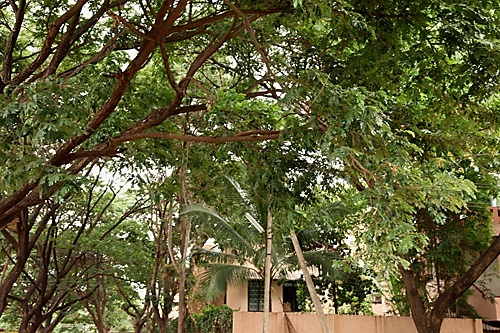 And when Hari and me arrived at my parents, the first crop of the sweetest organic mangoes from my parents garden welcomed us. Truth be told, as always I ate mangoes more than I cooked with it this season too! But then, I had to make something with the king of fruits, before he bid adieu this time. It had to be something really quick and simple to make too and that’s when I thought of this pudding. It is so simple and easy, yet has a touch of elegance to it, thanks to the royal mango! One of the greatest discoveries and joys for me this season is to know that Hari loves mangoes too! And yes, he did eat this pudding too, but ofcourse with some dramatic story telling from my end! But the person who really relished this was my brother who has a discerning taste for good food. I have been spending these last few days in my parental home before we board the flight back to Mumbai the following week, recuperating from my allergic cold, spending time with grandma and taking pictures. 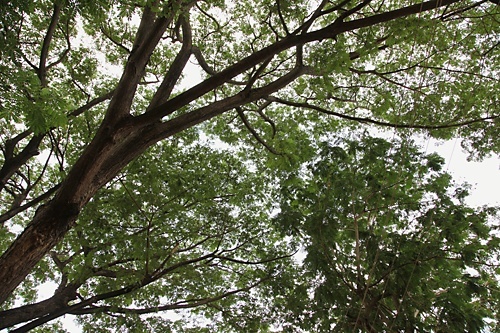 The gulmohar trees in the bylanes, the lush foliage overlooking the house and the sights of the green leaves from the windows is not just soothing, but also calming, enlivening and rejuvenating. As refreshing as my mother’s loving care! I served this mango pudding plain, but you could dress it up with chopped mangoes, praline or mango glaze. You could substitute the cream with milk, but keep in mind that the cream adds a lot of creaminess and texture to the pudding. Like I said above, you could dress it up with chopped mangoes or praline*. In a medium sized bowl, assemble all the ingredients and beat with a whisk or an electric blender until smooth and there are no lumps. In a saucepan, bring this entire mixture to a boil on a medium low flame, stirring all the while, about 8 to 10 minutes. Pour into individual bowls or a single bowl, bring to room temperature and cool in the refrigerator for a couple of hours before serving. Hey Anu… How hav u been? Iv been wanting to scribble some words for long, infact I complimented Aunty about ur blog n today i decided tht's it..
After long time, got the chance to look into this divine site n visually relish all ur dishes. As i'm pregnant n have the craving to eat rotis, can u plz post some side dishes for rotis. Fantastic pudding, looks super delicious and irresistible..
Harinakshi: Thank you for the wonderful words! So happy you enjoy divinetaste! Sridevi: Congratulations! Enjoy one of the most special phases of your life! I already have some side dishes for you. http://www.divinetaste.com/category/recipes/curries/ If you have any specific requests, let me know! Your so lucky to have access to real, fresh mangoes. 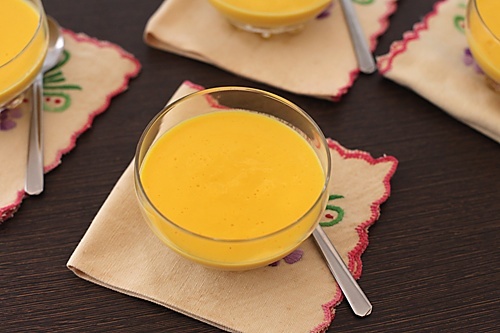 I've never tried a mango pudding but will try to hunt some down after reading your delicious post. what a great color of those mangoes, so yellow. It has been a while since I have such mangoes. What a delicious way to have mangoes! Just recently living in Kolkata. Had some not so tasty mango to use up and this recipe seemed the perfect solution. It was! I only have a microwave so that had to do for the cooking and no way to puree the mango except to mash with a wisk. Although I believe I followed all of your measurements precisely (exc less sugar) I needed an additional tablespoon of custard powder. I had no idea custard powder was basically cornstarch. Thanks for the adventure! the mango pudding looks so soothing to eyes & must have been delish 1 I make it the same way too and hey I tried your eggless golden yellow cake today and dressed it up with creamy chocolate icing- it was perfect !! thanks a ton, will be sharing it on my blog tomorrow- thanks again ! JC: It is delicious adventures such as yours that brings spice to life. Isnt it? Additional custard powder would make the pudding on the thicker side. How one prefers it is a personal choice ofcourse. Thanks for reporting your measures. Coming here after a long gap..was busy holidaying at mom's place. Looks like you had fun at your maternal place, lovely pictures..full of life! Would be fun if mango maniacs like us meet during mango season 🙂 Love this simple and delightful dessert, Anu. Mango Pudding is looking so delicious. Tomorrow is the last day for the event. Pls send your entries. looks beautiful! 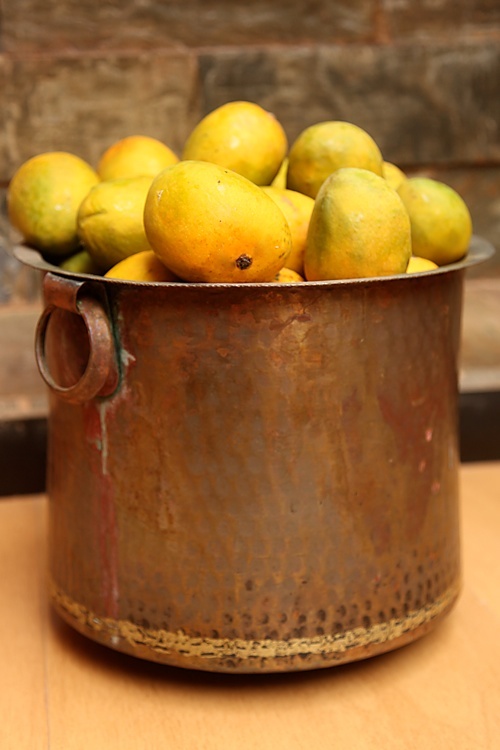 I have eaten tons of mangoes this season and have blogged several mango recipes! one more recipe to try!! I committed the same horror. Just gorged on mangoes the whole time, and now it's too late to make anything 🙁 They arrived so late this year! That pudding looks amazing, bookmarked for whenever I come across mangoes again. 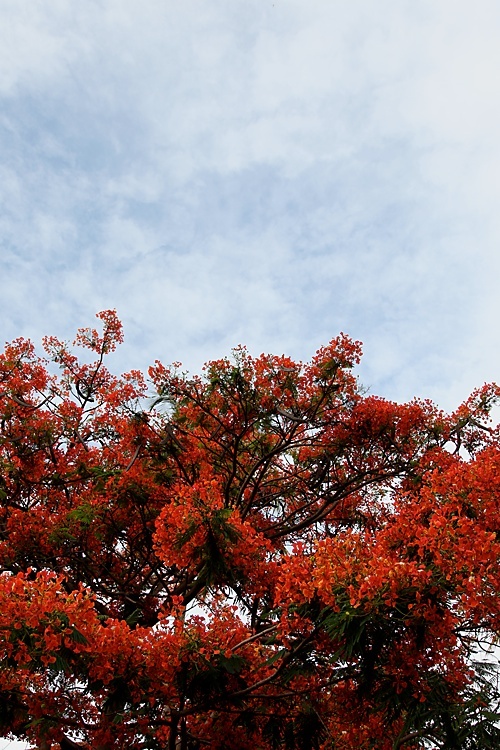 The sight of Gulmohar trees makes me very happy. 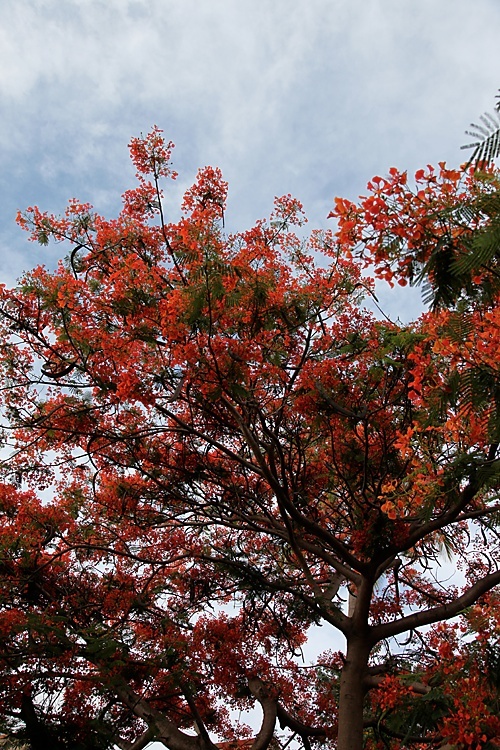 The last year, this time around when I was in Hyderabad visiting my parents, there were beautiful blooms on gulmohar trees everywhere. I also got to enjoy the mango season in India after a long time. Miss them badly this year. 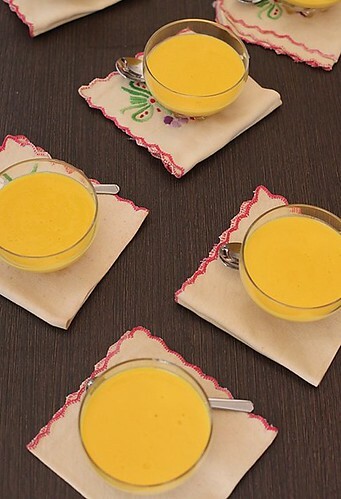 This mango pudding looks great, I will try to make it as well. The picture with the mangos in the bowl is really impressive! Joyti: Thanks for your appreciation! Georgiana: It is neither! But you will find a recipe for kheer here if you want to make it. 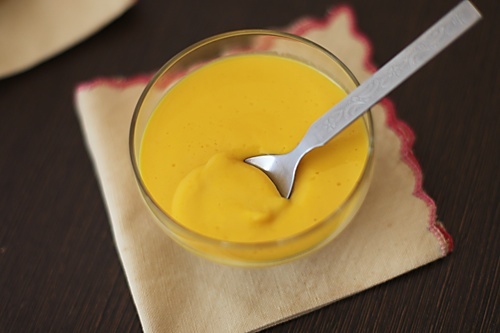 Michaela: I have been the exact opposite of you….loving mangoes all my life…so happy you liked this pudding! I would like to know which flavored custard powder to use.Should i use mango flavor or will any other flavor do? swetha: You can use vanilla flavoured custard powder. You can also use cornflour. I am so happy to come across Divine Taste. Its everything I've been looking for :). Tried the mango pudding today as I really wanted to make something with fresh mangoes and added custard powder. Methinks the result was a bit runny and smelt more of custard than mango even after being in the refrigerator for 6 hours. Should i stick to cornflour instead and increase the mango puree? As well as take 1 cup milk instead? Shaila: Thank you for your kind words. Please stick to cornflour in this recipe for better results. nice dessert very delicious yammy. hii.. plz tell me the recipe of kulfi becoz kulfi my mummy,s fav ,plz tell me the recipe of delicious kulfi. hell. how to homemade lagan nu castard ,plz tell me the recipe . looks nice. Jst bought the ingredients and some india mangoes. Going to make ths today. Hope it will turn well. I don't even know the way I ended up here, but I assumed this put up was once great. certainly you're going to a famous blogger if you are not already. Hi, thanks for your recipe..I tried it today and it just wouldn't set. this is my first time making eggless pudding so im not sure where i went wrong? I even doubled up the recipe and made a lot. PLease help me.. Thank you once again..
Theva: This is not a set pudding and has a creamy soft consistency. Nice pudding and easy to make. Thank u so much for dis easy but yammi receipe. Poonam. Glad your guests enjoyed this. Thank you for the feedback. You are just amazing and your recipes are excellent i have made mango cheese cake, chocolate cheese cake that i sell them as hot cakes.and the mango pudding is so easy that my husband makes it. Thank you so much. veena: I'm glad you are able to make and sell my recipes. Thank you for coming forth with it. I am unable to get china grass here (Johannesberg). Is it possible to avoid it? or may be some other replacement besides gelatin. sorry commented in the wrong recipe. you can delete this. 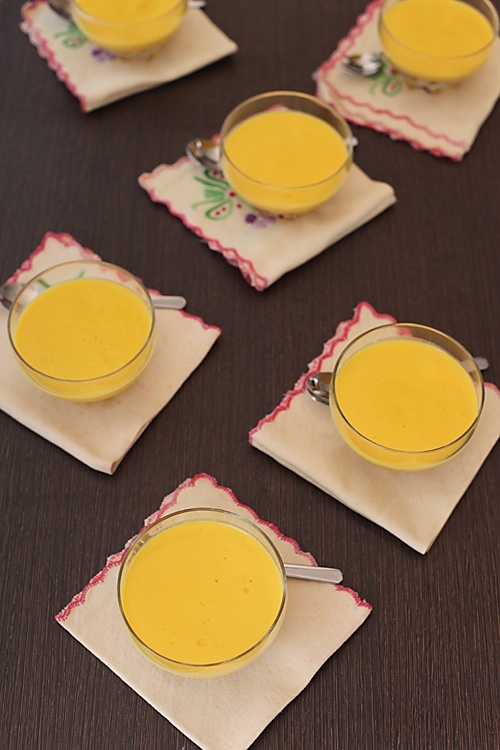 Thanks Anushruti, for the simple and easy to make mango pudding recipe. Looks delicious. hi.. thanks for sharing your amazing talent. I followed your recipe of mango pudding by each word. but the result was not like a bite of pudding (mine was more like a thick creamy mongo kheer, I had used custard powder) I read in above query u said that it would be of soft creamy texture. but if want to make like actual pudding texture then should I add agar agar with/or custard powder/cornflour. also I have seen that whenever we put heavy cream on flame..it loses its fluffiness and becomes like milk only.. so do you think this could be a reason? bhawna- You can add agar agar for a different texture.